A 2-player Icehouse Game with 3 rules. Place one full nest of Icehouse pieces on each square of the row that's along the edge of the board that is closest to you. Your opponent sets up along the opposite edge. Take turns moving. On your turn, move any one piece of your color that is on top of a stack to any adjacent square (including diagonals), and stack it on top of any pieces that are already there. 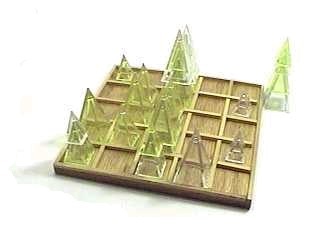 After your move, if the destination stack has fewer points touching the board than not, the stack sinks into the mud and all pieces in it are removed from the game. If it's your turn and you cannot make a move, you lose. If your opponent also cannot make a move, you both lose. All the pieces in a square of the board are part of one stack, even if they are not touching each other. For instance, a 3-pointer placed over a 1-pointer forms a 4-point stack even though the 3-pointer is not resting on the 1-pointer. Both of the pieces in this example are touching the board. Basically, "touching the board" means a piece is resting its base on the board, or should be. By saying "should be", I'm acknowledging that due to manufacturing, some pieces are irregular and don't do what they are "supposed" to. Martian Mud Wrestling uses the standard 1-point, 2-point, and 3-point designations for the small, medium, and large pieces. These values correspond to the number of pips on one side of each piece. In Zendo terms, a piece that's touching the board would be a "grounded, upright" piece. A piece does not touch the board if it is resting on another piece. Zendoizing again, such a piece would be "ungrounded" and "upright". All pieces in MMW retain the upright orientation. In a "full nest" of pieces (that is a 1,2,3 stack with the one placed first, covered with a two, then covered with a three) like you start with, all six points (1+2+3) are touching the board. In a "full tree" (3,2,1 stack), the large piece is touching the board, and the other two pieces are up in the air. That makes 3 points touching the board and 3 points not touching the board. Returning to the "full nest" described above, it's the most stable base you can have. It can support *six* more points worth of pieces without sinking. The "full tree" is very unstable; it's already even (2+1 on 3) and one more piece of any size will sink the whole stack. A stack of a single 3-pointer is pretty stable. It has 3 points touching the board and no points up in the air. You can place any piece on top of it safely, but any piece you place on it will be up in the air. If your opponent puts a 3-pointer on top of it, the stack is now even (3 on 3) and one more piece of any size will sink the stack. If your opponent puts a 1-pointer on it, the situation is more complex. The stack is now "1 on 3". If either of you places a 3-pointer on the stack it will be "4 on 3" and it will sink into the mud. If either of you places a 2-pointer on the stack, it's now even at "3 on 3". If either of you places another 1-pointer on it, it's only "2 on 3" so it can still support one more 1-pointer but placing a 2- or 3-pointer on the stack will sink it. The most confusing stack is a 1,1,3 stack. 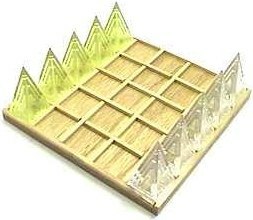 A 1,1 stack is even, so it seems like a 3-pointer would sink it, but the 1,1 stack isn't tall enough to keep the 3-pointer of the board; the 3-pointer rests directly on the board (if there are no manufacturing problems) so there are 4 points touching the board and only 1 point not touching the board.